Book Challenge Day 6- Most Overrated Book | What are we...the Whos? Now, before you decide that I’m just not intellectual enough to appreciate non-fiction, you should know that I have actually read and enjoyed nonfiction books in the past. Biographies and memoirs are my favorite book style (granted, they’re genrally done in a story format), but I’ve also read some straight-up biographies and really enjoyed them. But, this book was just plain boring. It’s positioned as a “novelistic” nonfiction and I don’t see it. There was a ton of architecture focus, which I expected to be a little dry, but Erik Larson even managed to make a murderer boring. This was supposed to be a terrifying human being and I just didn’t get that. I am one of those people that absolutely cannot stop reading a book once I’ve started and, had I not had to read this for a (somewhat failed) family book club, I would have stopped. 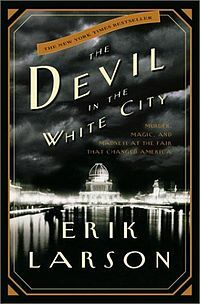 Posted in Authors, books, Reading, Writing and tagged 30-Day Book Challenge, Devil in the White City, Erik Larson. Bookmark the permalink.